It was bound to happen. Even the act of reading a book — seemingly that most solitary of pastimes — is starting to plug into social media. Amazon's Kindle is currently the top e-book reader in terms of market share. And while the company hasn't said exactly how many Kindles it has sold, at least one source puts the number at more than 3 million, as of April, which was before Amazon cut prices, causing a spike in sales, and well before the new third-generation Kindles began shipping to customers this month. 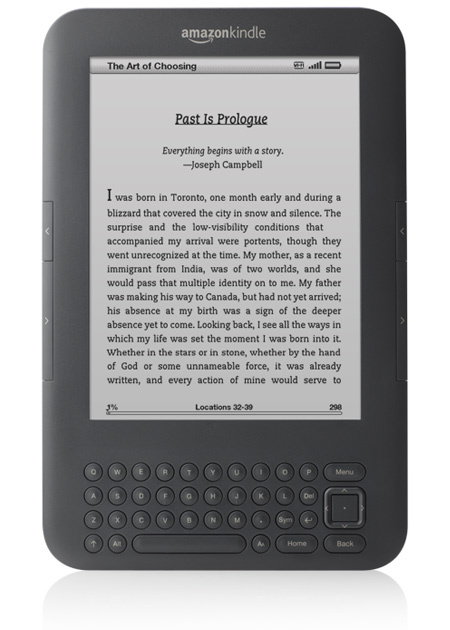 Amazon says its new 3G Kindle is the fastest-selling model yet, and earlier this year, the online retailer said it was selling more e-books than hardcover books. All that would be impressive enough, but Amazon isn't the only player in the e-book game. Apple's iPad has quickly gained 22 percent of the e-book market, according to Apple, whose CEO Steve Jobs is never shy about telling you exactly how many units his company has moved. Jobs says iPad users downloaded more than 5 million e-books in the first 65 days the iPad was on the market. Is your head spinning yet? Well, hang on. Brick-and-mortar bookseller Barnes & Noble's Nook e-reader has about 20 percent of the e-book market, according to company figures. The Nook is the one truly bright spot on B&N's balance sheet. And none of this includes Sony's e-reader or tablet devices powered by Google's Android operating system. But what does any of this have to do with reading becoming a social activity? Books are making the leap from paper to pixels faster than anyone — apart from Jobs and Amazon CEO Jeff Bezos — could have anticipated. E-books are reaching a critical mass of readers. And where there is a critical mass of anyone in an electronic environment, social networking inevitably follows. After swearing I would never give up physical books and all of the sensations that come with them — the feel and smell of the pages — I finally made the jump to e-books. I bought one of the new 3G Kindles. It was a matter of safety as much as anything. One of the stacks of books I have piled on the floor of my home office — my shelves are all full and sagging under the weight of my library — toppled and nearly hit me in the head. E-books may not be a perfect substitute for real books, but at least they won't try to kill me. One Kindle feature I discovered is it allows you to highlight passages of any e-book and then retrieve your highlights with just a few clicks. It's a handy feature, especially for those of us who cringe at the thought of permanently defacing a physical book. But that's not all. Kindle allows you to share your notes and highlighted passages with friends via Facebook and Twitter. And, as you're reading, it lets you know if a passage has been highlighted by other Kindle users. For example, I'm currently reading "How Pleasure Works: The New Science of Why We Like What We Like" by Paul Bloom. It has more highlighted passages than any other book on my Kindle. The most popular passage, highlighted by 44 readers so far, begins, "What matters most is not the world as it appears to our senses. Rather, the enjoyment we get from something derives from what we think the thing is." E-books are in their infancy. So it's only likely that Kindle, iPad and other e-readers will greatly expand on this rather simple social-networking feature as time goes on. And it isn't as if reading has always been completely solitary. Weekly book clubs have been around for as long as there has been widespread literacy. But now I find myself in a virtual book club with strangers I don't know and will never meet. We just happen to be reading the same book and, sometimes, highlighting the same passages.